Do you remember listening to your favorite radio shows on a radio, like this one below, in the “good ol’ days”? Old Time Radio shows still play an important role for many of us radio fans. 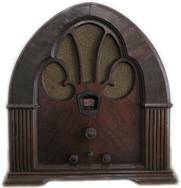 Did you know that Old Time Radio shows are still available on Internet radio? Internet Radios host many stations that play a variety of OTR shows. The shows are available with perfect clarity and no interferences; it will bring you right back to the good ol’ days! Would you listen to an Old Time Radio show on an Internet Radio? Do you remember listening to your favorite radio shows on a radio just like this one in the “good ole’ days”?